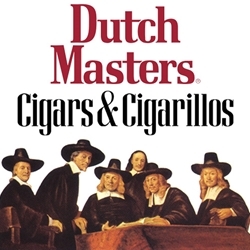 Dutch Masters are classy machine made cigars produced from premium quality, hand-picked tobacco leaves. Since its inception in 1911, Dutch Masters machine made cigars have been a house hold name and American bestseller. Crafted by the masters of Altadis USA in Puerto Rico these affordable discount machine made cigars consist of fillers and HTL binders packed with Caribbean basin Cuban-seed tobacco blends enclosed using natural tobacco leaf wrappers. Once ignited, they give off a mellow, pleasing smoke, plus smooth, mild flavors and aromas. To add to this distinctive machine made cigar brand of classic smokes are the Dutch Masters Cigarillo line which comes in many distinct flavored infusions Berry, Honey, Rum, Java, and Irish Cream. Because they come in a wide variety of sizes and flavors, cigar lovers everywhere have grown to appreciate how good quality machine made cigar like Dutch Masters. Here at Smokers Discounts we believe you will too! We’ve made it easy and affordable to buy cigars online. Call us for more details!